We arrived in Amsterdam at approximately 8:00pm on Wednesday evening. Glad to be leaving Staadscamping and their disinterested staff and extortionate fees. We borrowed all over their services before leaving to get the camper fixed and said goodbye hoping to never have to return there again. We’d spent Tuesday afternoon/evening walking the whole of Rotterdam, trying to find bits to fix the bathroom roof light with. 14 Kilometres later and a damaged Justina, we were not looking forward to 6 hours walking in Den Hague whilst being fixed. New Shoes, new found enthusiasm and a new (cheaper) stop over by the end of the day. But, true to form of this holiday so far, just as we enter the outskirts of Amsterdam, our satnav gives up the ghost! Well it did. And then it didn’t. And then it did again. Two hours of snippets, mashed internet, mobile data download limits later, we find the stopover! Thursday we knew we needed a lie in, and with the idea of Amsterdam needing to be experienced in the evening, we knew we weren’t going to surface til at least lunchtime! We woke to the gentle drumming (and dripping in the bathroom) of steady rain, under dismal, disheartening grey skies. No words were spoken, we just grabbed bathrobes, coffee, nicotine, kindles and waited…for the internet to come back on! 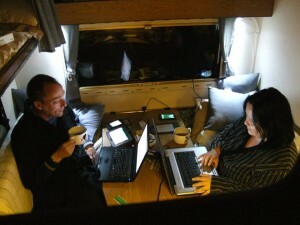 Here we are joyous on our duvet day that someone rebooted the WiFi so we could catch up with the world…at 10:00pm!!! !